An amazing cider can be the perfect drink for summer: delicate, crisp and refreshing. And thanks to America’s recent hard cider obsession, you can find more brands than ever before. But in some ways, these two cider truths don’t always coalesce: Though potentially summer-friendly ciders, ones that come in 12-ounce bottles or (even better) cans are easy to find, most of them leave us wanting – typically the cans come down on the sweet and decidedly boring side of the cider spectrum. Meanwhile, the best ciders tend to come packaged in big bottles, not necessarily what you want to lug to a barbecue or picnic. This year, Shacksbury Cider is finally giving casual summer drinkers the gift didn’t even know they deserved. For a few years now, the Vermont cidery has been making some of the best ciders in the country – styles like their natively fermented and unfiltered Lost and Found and their earthy and dry Classic – all, as expected arriving to the store in larger bottles formats. 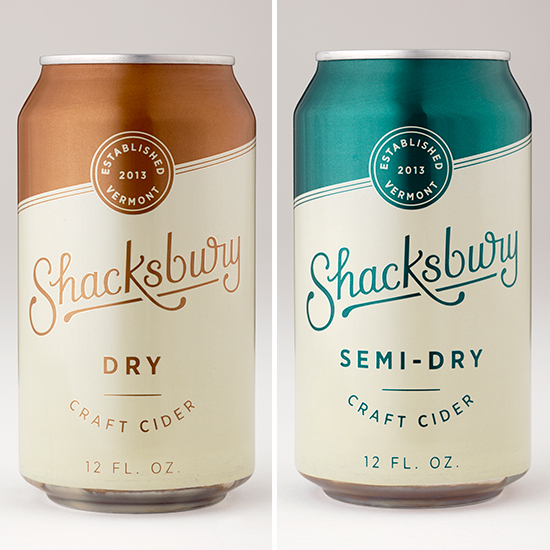 But starting this month, Shacksbury will send two new varieties into the world, Dry and Semi-Dry, both of which will be available in 4-packs of 12-ounce cans. “We were excited to go into cans because it makes the ciders more approachable, more affordable, and more portable. But just because they’re in cans, it doesn’t mean we cut any corners,” explained Colin Davis, the brand’s cofounder and cidermaker. What sets these new Shacksbury offerings apart from other cans you might pick up is the impressive way they balance complexity and drinkability. Take the Semi-Dry, for instance – a cider that still drinks far drier than most of what you’ll find on the market. The nose has just enough farmhouse to make you feel like you’re strolling through an orchard, and the taste has enough acidity and tannins to help those residual sugars coalesce into delicate fruitiness, all while drifting into an earthy finish. The Shacksbury Dry is equally delightful yet still distinctly different, possessing similar mildly funky and earthy notes while pushing a far more citrusy agenda that can leave you feeling like you were sucking on a lemon drop. Both ciders are intense, but at the same time quaffable, begging you to go back and explore them with another sip. Fortunately, thanks to Colin Davis and other cidermakers like him, it doesn’t have to be.